This is a little more ‘matchy matchy’ than I typically like, but I’m doing it anyway! I made these blocks for my string quilt tutorial, and so I needed a way to use them…. 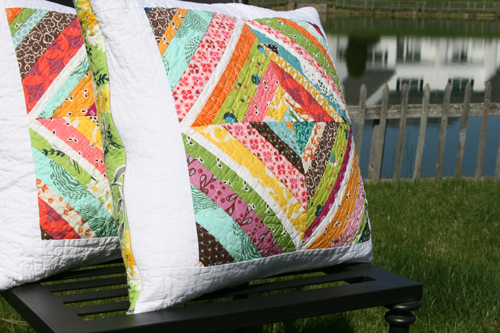 quilted pillows…yes, please! I put together four blocks for each pillow and then framed them with white to make them large enough to fit an 18″ pillow. The back is one of my favorite green Flea Market Fancy prints. 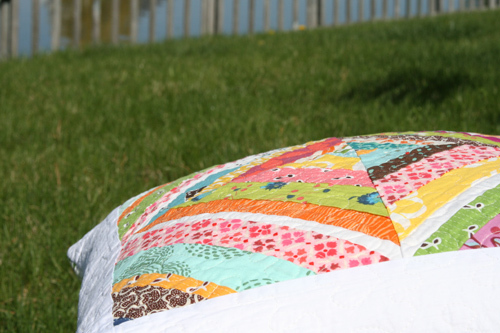 Both sides are quilted and then sewn together with an invisible zipper. This entry was posted in Household Goods and tagged handmade, Quilt Blocks, quilted pillows, string blocks. Bookmark the permalink. I love it! I just made a string quilt pillow last night. Love it. I’ve never tried making pillows, but this might just inspire me to give it a shot! I like them! whats wrong with a little matchyness? LOVE it! I’m going to use your string block tute to make a little mat for our entry way! So excited to try this method out. I simply love the look of it! I think you are beautiful. I see a little Yankee Swap in your future! As usual, love it! So, did you quilt each side with some batting under the fabric or quilted piece and then sew it all together. I really love the idea of a quilted pillow. And I have to say this every time I comment but darn, you are FAST! They are wonderful! They will look great together. I just Love the string quilt. You are sooo clever. I am in a place unable to buy fabric right now, but have lots of biggish scraps in plain colours and a big piece of white satiny-type stuff – all thrift stuff. Do you think it would look okay as a string quilt? I am longing to have a go – not made a quilt in years. Also love your dresses. Used to make all my own when I lived in Africa. Do you have a pattern for a lady who doesn’t like to show her arms or cleavage, but likes to look pretty? I can’t find a pretty dress that’s not for a skinny/young/tall/thin/shapely person. I am not these anymore!! I am going to look at your site every day now that I have come out from under the rock!! Thank you. Sue. i love these pillows! the back fabric is so dreamy! Those pillows are totally fantastic! These are so happy and bright!! Thanks so much for the tutorial. I will have to give it a try. As usual – I love your work! So beautiful! Just love your blog – everything is beautiful! i think the wide white border really makes them sing. I’m new to quilting and LOVE your work. Any suggestions for a good machine quilting tutorial? 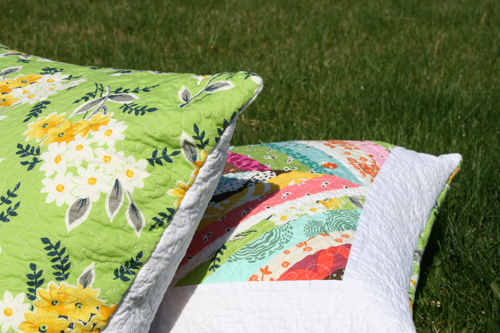 I can’t wait to make the quilt that matches these pillows! LOVE IT!! Wondering if you sell these pillows as well…forget the swap! I may not be able to wait that long. These are so awesome! My man would think I went off the deep end if I made another pillow though. So pretty! I know I couldn’t make a spiderweb quilt, but some pillows – that seems doable.